Both of my children attend the same high school, so I decided to try to be active in the parents’ association. When I saw they had a book club, I was like-hell yes! So I signed up! Now this was not my first book club. I did belong to one that consisted mostly of the moms of my kids’ friends, all in my town. “Book Club” consisted of usually 10-15 of these moms-those lucky enough to have a sitter, or a husband who didn’t work too late that night. There was spinach dip, cookies, oh and wine, LOTS of wine. The book cam up once that evening, usually half way through, when someone hesitantly said-“shouldn’t we talk about the book?” The discussion would last about ten minutes because only 3-4 people had actually read it, then the dessert would come out and more wine, of course. Now don’t get me wrong- this was enjoyable. I got to see some friends I didn’t see too often otherwise. But it was certainly not about the book. EXCEPT the time they chose to read Fifty Shades of Grey– not kidding. Then, the entire group not only showed up, but they had ALL read it. The host even went a little too out of her way to have the snacks tie in with the book. Less said, the better! Fast forward to this week, for the new book club. It was held in a beautiful room in the high school (where I guess they usually ask people for $) There was water, and salad, some hummus- an actual healthy lunch fro a local place. And one of the teachers from the English department chose the book-The Absolutely True Diary of a Part Time Indian– and was our guest speaker. Everyone read the book! People came ready to discuss it! And the teacher- a wonderful woman who I wish I was friends with- was brilliant. Not only did she discuss the book, but she asked us about certain themes- Hope, Despair, Racism. I wanted to take her 9th grade Lit class! I will confess that I had actually forgotten to read the book before last weekend. Thankfully it is a very quick read. But now I am desperate to belong to a book club that actually want to read! And not trashy books, or quick beach reads. I will have to see what I can find. Until then, I will enjoy being a part of this new book club, which unfortunately does not li,it itself to literature or even fiction. The next guest is a physics professor, and yea has chosen Biomimcry as our next book. Uh oh…..
By the way- I loved the book. It will be on my list of favorite reads. I am so glad my daughter had to read it over the summer. This club sounds great! The physics sounds hard going but I love the sound of guest speakers and how organised it is! Hmm, I wonder if people were more prepared to discuss the book because the club met at school? Even as adults, people probably don’t want to be caught without their “homework” by a teacher, in school. It’s interesting that this club was so different! It definitely felt like it wasn’t totally social in nature, which was nice. This sounds perfect. 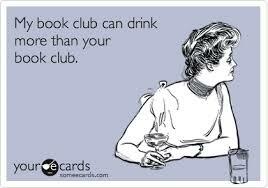 I think a lot of times people join book clubs for the social aspect. They think it will make them readers, but it usually doesn’t. Kerri, if they’re accepting submissions, please let me know. Not Without My Father: One Woman’s 444-Mile Walk of the Natchez Trace might be a good discussion book for a group like this one. My publicist would be happy to send them advance copies, if you can get me contact information. Thank you. I am new to this, but I think they ask members of the faculty to be guests, and the teachers pick the book. I will ask the person who runs it though. The book sounds wonderful! Perhaps you could start one on meetup.com this way you can read some more of the serious books. It costs money to start and run one through there but you could always search to see if there is one established in your area. Its a great website! It sounds great! I read an article recently about how facilitated book clubs are becoming more popular, with a “professional” (teacher, writer, or someone knowledgeable about the subject matter) leading discussions and keeping the conversation on track. It sounds like the Alexie book was a perfect fit (and it’s one of my favorites too!). I was surprised by how much I enjoyed it! Kerri, I’ve worked at an independent bookstore for many years and we run a book club that is serious — everyone reads the book. Is there a good bookstore in your area? I’m in a neighborhood book group as well, and it’s mostly about the friendship and the wine, which is fine . . . but I was yearning for a serious group. (In addition to my bookstore group, which isn’t so much fun for me because it’s actual work for me.) So I picked three friends who are all avid readers and we meet once a month for coffee and to discuss a book. We’re considering asking others but right now the chemistry is really good. We don’t want people who join a book club so they will “have to read”. We want people who are already reading a lot and dying to talk with others. I envy you. Most women I know aren’t very serious readers- except my Mom and she prefers different book than I do.